Brian Johnson – LHP – Florida – Jr. 6IP 5H 3ER 0BB 6K. (W, 2-0). 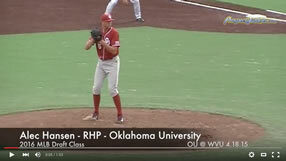 Greg Larson – RHP – Florida – Sr. 2IP 1H 0ER 0BB 2K. Daniel Gibson – LHP – Florida – So. 1IP 0H 0ER 0BB 1K. Matt Price – RHP – South Carolina – Jr. 6IP 4H 1ER 1BB 6K. (W, 2-0). Tyler Webb – LHP – South Carolina – Jr. 1.2IP 1H 0ER 1BB 2K. Through 7 appearances and 10.2IP, has not given up a run while only giving up 4 hits and striking out 13. Forrest Koumas – RHP – South Carolina – So. .1.1IP 1H 0ER 0BB 1K. (S, 3). DJ Baxendale – RHP – Arkansas – Jr. 5IP 6H 2ER 1BB 3K. (W, 5-0). Ryan Eades – RHP – LSU – So. 8IP 10H 4ER 0ER 7K. (W, 3-1). Jerad Grundy – LHP – Kentucky – Jr. 7.1IP 3H 0ER 0BB 7K. (W, 3-0). Will Clinard – RHP – Vanderbilt – Jr. .2IP 0H 0ER 0BB 0K. Andrew Smith – RHP – North Carolina – So. 0IP 0H 0ER 1BB 0K. Daniel Gossett – RHP – Clemson – Fr. 1.1IP 0H 0ER 1BB 0K. Scott Firth – RHP – Clemson – Jr. 0IP 0H 0ER 2BB 0K. Carlos Rodon – LHP – NC State – Fr. 7IP 4H 1ER 2BB 6K. (W, 3-0). Freshman All American candidate with resume building win against #10 Georgia Tech. Jonathan Gray – RHP – Oklahoma – So. 7IP 8H 2ER 0BB 10K. (W, 2-2). Possible 1st round pick in 2013. Dillon Overton – LHP – Oklahoma – So. 9IP 6H 1ER 0BB 6K. (W, 3-0). Rob Zastryzny – LHP – Missouri – So. 6IP 5H 1ER 2BB 3K. (W, 2-1). Brett Mooneyham – LHP – Stanford – Jr. 6IP 6H 3ER 4BB 9K. (W, 4-0). Dean McArdle – RHP – Stanford – Jr. 2IP 4H 3ER 1BB 1K. Brandon Bonilla – LHP – Arizona State – Fr. 1IP 0H 0ER 0BB 0K. Konner Wade – RHP – Arizona – So. 5.1IP 9H 6ER 3BB 3K. (W, 3-0). Nick Vander Tuig – RHP – UCLA – So. 6IP 6H 4ER 3BB 3K. Scott Griggs – RHP – UCLA – Jr. 1.1IP 1H 1ER 2BB 3K. (S, 4). Jake Reed – RHP – Oregon – Fr. 6.2IP 5H 1ER 3BB 3K. Tough loss for freshman against Oklahoma but pitched well. Dace Kime – RHP – Louisville – So. 3IP 1H 1ER 2BB 2K. Product of same High School as Chad Billingsley and Jon Neise. Jeff Thompson – RHP – Louisville – So. 4IP 8H 5ER 1BB 3K. Matt Koch – RHP – Louisville – Jr. 1IP 2H 0ER 0BB 1K. Ryan Harvey – RHP – Seton Hall – Jr. 4.1IP 2H 0ER 2BB 8K. Matt Carasiti – RHP – St. John’s – Jr. 5.2IP 6H 0ER 1BB 5K. (L, 0-2). Austin Kubitza – RHP – Rice – So. 3IP 8H 7ER 1BB 4K. (L, 1-1). Against #2 Stanford. John Simms – RHP – Rice – So. 2.2IP 3H 2ER 1BB 1K. Eric Skoglud – LHP – Central Florida – Fr. 3IP 9H 1ER 1BB 1K. Matt Anderson – RHP – Long Beach State – Jr. 6.1IP 8H 3ER 1BB 4K . (W, 1-0). Alex Muren – RHP – Cal State Northridge – Jr. 7IP 8H 2ER 1BB 3K. (W, 3-1). Austin House – RHP – New Mexico – Jr. 9IP 9H 0ER 1BB 7K. Zak Qualls – LHP – UNLV – Fr. 6.2IP 1H 0ER 1BB 5K. (W, 1-0). Lex Rutledge – LHP – Samford – Jr. 1IP 1H 0ER 0BB 2K. David Whitehead – RHP – Elon – So. 2IP 0H 1ER 3BB 1K. Dan Smith – LHP – Monmouth – Jr. 8IP 10H 5ER 2BB 3K. Kevin McAvoy – RHP – Bryant – Fr. 3IP 6H 3ER 3BB 2K. Michael Wagner – RHP – San Diego – So. 1IP 1H 0ER 1BB 1K. Scott Frazier – RHP – Pepperdine – So. 9IP 6H 1ER 1BB 3K. (W, 2-2). Esteban Guzman – RHP – San Jose State – Sr. 6IP 6H 2ER 3BB 8K. Tom Windle – LHP – Minnesota – So. 1.2IP 6H 2ER 3BB 2K. (L, 2-2). Brandon Magallones – RHP – Northwestern – Fr. 2IP 3H 3ER 0BB 2K. Matt Ogden – RHP – Michigan – Fr. 2IP 2H 3ER 4BB 1K. (L, 0-1). Steve Weber – RHP – Eastern Michigan – Jr. 4IP 11H 6ER 1BB 2K. (L, 1-2). Ben Dartnell – RHP – Eastern Michigan – Fr. 1IP 2H 1ER 1BB 1K. Ryan Bores – RHP – Kent State – Jr. 5.1IP 10H 6Er 3BB 2K. Ive have seen Dace Kime pitch and he has some of the best stuff I have sen in a college pitcher. I wish they televised more college baseball games so I could see these guys pitch more often. Great information! I find myself reading your blog quite often! Keep up the good work.